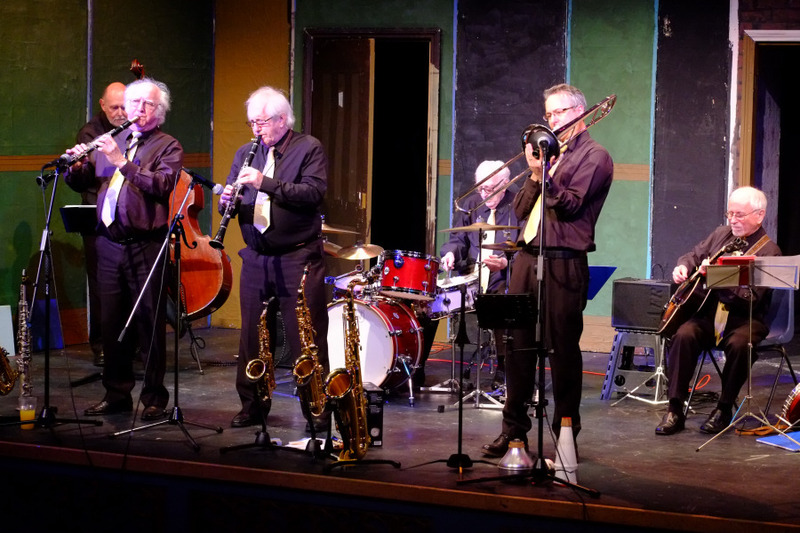 Sunday afternoon saw The Apollo Theatre transported back to the early days of New Orleans trad style jazz as the Chris Pearce Sopranos Jazz Band entertained the members of Newport Jazz Club. Known as "The Sopranos" as the front line features two soprano saxaphones the band drew on the songbooks of Sidney Bechet as well as as a couple of Ellington numbers "Mood Indigo" and "The Mooche". An interesting diversion was the bands jazz interpretations of a Willie Nelson country number "Angel Flying Too Close to the Ground" as well as an Arlo Guthrie folk number "In My Darkest Hour" proving that music is indeed a universal language. Their twenty number set gave the band plenty of opportunities to show their virtuosity with features for all of the front line. The full line up of the band featured Chris Pearce and Andy Leggett on saxaphones and clarinets, Dave Deakin on trombone, Ian Parry on guitar and banjo, Tony Sharp on bass and John Hall on drums.